I'll first state the obvious, that living on a budget is hard enough. But if you love gorging yourself with all kinds of food, it's even more difficult to keep that wallet shut. So, in order to balance out my going out to eat at different, new-to-me restaurants -- I consider it all a part of my food education -- I have to figure out cheap meal plans to hold me over for the rest of the week. 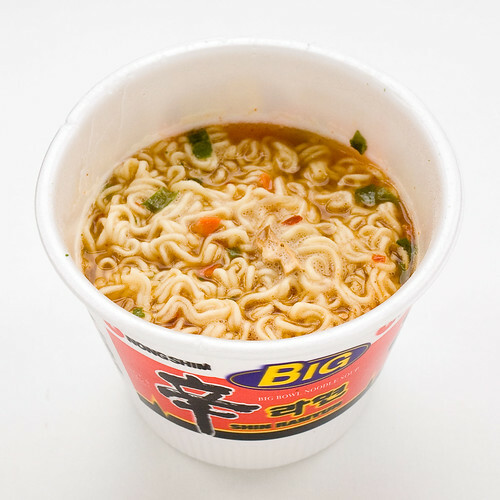 But I'm done eating like a college kid, even though I'll sheepishly admit that Maruchan Noodles eaten raw with the seasoning is freaking delicious, and that on a rainy day there's just nothing quite like a hot Shin Ramyun cup. I declared quinoa as my savior -- and although a bag will set you back about $12, it lasts forever. I know, this is nothing new since everyone and their mom is raving about it. I also already had a kale obsession. And I just happened to have a bunch of lemons in my fridge. The resulting dish lasted me for the week, having kept well for 5-6 days. It's filling and fresh, and because I sautéed the kale, this salad had an earthy savoriness that kept me wanting more. 1. Cook the quinoa: Over medium heat, add the quinoa to a saucepan and toast until it pops steadily and smells nutty, about 3 minutes. Add the water, bring to a boil and loosely cover until the quinoa has absorbed most of the water, about 12 minutes. Turn off heat, stir, cover and let sit about 10 minutes. Fluff with fork and set aside. 2. Prep and chop veggies: Meanwhile, drain the garbanzo beans, tear the kale into bite-sized pieces, chop the shallot and tomatoes and tear or chop the basil. 4. Transfer the cooked kale and shallots to a large mixing bowl. Add the quinoa, chickpeas, tomatoes and basil. Add a pinch or two of salt and pepper. Toss until well combined. 5. Whisk together lemon juice, lemon zest and 1/3 cup olive oil. Season with salt and pepper, to taste. Add 3/4 of the dressing to the salad and toss. Add additional dressing to taste. Why toast the quinoa prior to cooking? Toasting the quinoa seeds just before adding the water gives it another dimension of flavor. The result is nuttier and more flavorful. Why sauté the kale? Sautéing the kale eases the bitterness often associated with this hardy green. Combined with the nutty quinoa, the flavors are balanced well with the refreshing lemony dressing.